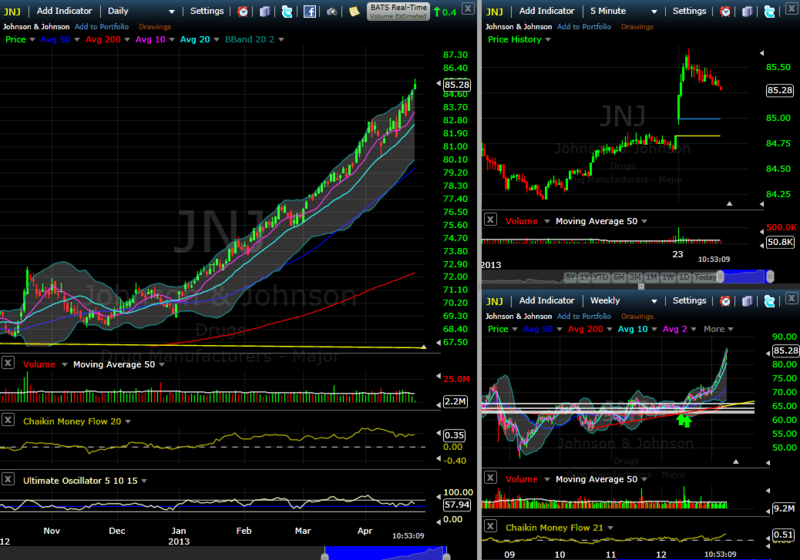 (JNJ) – is Johnson and Johnson heading into a parabolic run up to crash later? Although JNJ is excellent company with a wide moat and a great dividend payer, the recent trend is too close and similar to a parabolic uptrend. Trend like this always ends up with a crash. I would be however happy with it because I want to add more shares of JNJ to my portfolio. Pay attention to a 5 year chart on the lower right corner which resembles an image of a parabolic run up. I may be wrong, but try to get ready in case to correction comes. I certainly hope so because I’d also like to get some shares of JNJ. JC, I agree. I am desperate to add more JNJ. When the stock was falling due to recalls I was buying (see the green arrows on the 5 yr chart @ circa 58 a share). I hope we will see some correction soon.